A meditation workshop inside the Forest of Everywhere led by Bhante Punna. Join Bhante Punna for an intimate and inspiring meditation workshop nestled inside the enchanted immersive landscape from our latest adventure, The Forest of Everywhere. Both newcomers and long-term practitioners can benefit from this engaged discussion and practice. Bhante will answer all your questions about starting or maintaining a meditation practice, expectations or worries you may have about meditation, different styles and schools of meditation, techniques, and postures, and how meditation relates to other spiritual practices. Enjoy complimentary hot tea and the chance to explore the set of the Forest of Everywhere at the conclusion of the workshop. Chairs will be provided but you can bring your favorite cushion if you prefer to meditate on the floor. 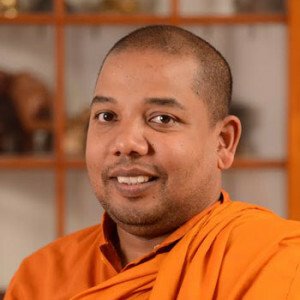 Bhante Punna is a Buddhist monk from Sri Lanka who was ordained at the age of 10 years of age in 1983. Bhante Punna’s monastic education and training was with a respected and renowned Pali scholar, most Venerable Kodagoda Gnanaloka Maha Theor at Vidyachandra monastery in Galle, Sri Lanka. Prior to coming to the United States in 2007, Bhante Punna served in a Buddhist monastery in Brisbane, Australia. At the Pittsburgh Buddhist Center Bhante Punna is known for his Loving Kindness meditation instructions. Bricolage is pleased to offer tickets to this event at any price! You can reserve your spot online for as little as $5 or pay any amount at the door starting at 6:30pm. However, space is very limited (fewer than 30 spots available) and we recommend reserving your spot in advance. Tickets are available on a first come, first served basis. Please be advised that no programs – including Braille or large-print programs – will be available at this event. Meditation will take place on the set of Bricolage’s production The Forest of Everywhere, an environment designed with sensory sensitivities in mind. Bricolage’s space at 937 Liberty Avenue is designed for wheelchair access and features accessible all-gender restrooms. Bricolage is committed to providing an environment that is inclusive and welcoming to all patrons. We encourage you to identify any specific accommodations that would make your experience more enjoyable, or any other requests in the comments section when purchasing tickets, by calling us at 412.471.0999, or by emailing Fred at fred@webbricolage.org.